Bangladesh is located in the South Asian region. Geographically it is almost totally surrounded by India, except for a border with Myanmar on southeast and southern coastline on the Bay of Bengal. Teesta River is an arch river in the northern part of Bangladesh. Most of the Bangladeshi rivers originated from Nepal or India and after flowing through Bangladesh meet the Bay of Bengal in the south. But as lower riparian country Bangladesh does not get its due share of river waters. As India is emerging as a world power Bangladesh cannot raise the disputed issue in the regional or world forum. Protracted bilateral discussions failed to resolve the issue. River dependent Bangladesh economy suffers a great deal as agriculture, trade and commerce greatly suffers. The Teesta River originated from the Himalayas in the north to flow into Bangladesh through the Darjeeling and Jalpaiguri. Former name of the river was at distam, Present Teesta named as diverted form of Sanskrit Trisrota (three flow way). Three valleys flowed from Jalpaiguri in three ways. Southern stream was Kortowa, Atrai middle stream and other was Punarbhaba. 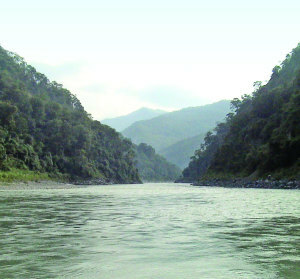 Rivers in North Bengal are famous for changing the course, the Teesta implies strongest role in drainage in these region. 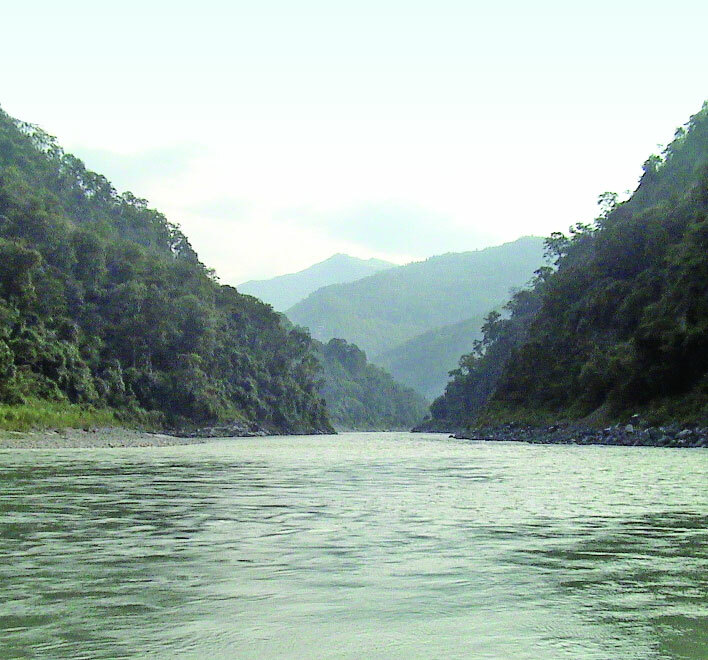 Before 1787 the Teesta originated from theglacial region of North Sikkim revealed lacena Zhu, Zhu lacuna and the Teesta river on the south side as Lonakacura Combined Atrai section, alloy with Punarbhaba stream and Mahananda flows to meet the combined contain the name of hurasagara Jafarganj (current Goalando ) had fallen to the Padma. Gajaladoba dam has become deadlock for Bangladesh. Due to this Barrage Teesta is going to be another Padma. Teesta has not enough water. In order to withdrawal of upstream water of the Teesta water, during the dry season that has been turned into the bottom of the water at not being able to irrigate fields. Teesta water flow the dire situation can be realized by mentioning figures of the last few years. Water stream in January 1999 was 1033 cusecs, 2000 in 4530 cusecs, 2001 in 1406 cusecs, 2002in 1000 cusecs, 2003 in 1100 cusecs, 2006 in 950 cusecs, in 2007 it became 525 cusecs, 2008 in 1500 cusecs. India is now in full control of Teesta water. Gozoldova embankment of the Teesta patrons India in complete control over Teesta water then irrigation projects in Bangladesh are going to become obsolete. India and Bangladesh share 54 rivers between them. Despite setting up a Joint River Commission for water management as early as 1972, tensions between the countries on how to share resources recently came to a head in a dispute over the Teesta River. The lives of countless people from Bangladesh are at stake who depend upon the river for their survival. River center is involved in the public life and livelihood. Biodiversity is threatened by the lack of water. Agriculture is damaged, smooth navigation and commerce – trade and the natural environment such as a lot of hundred Perch and domestic birds. The surface of the water level has dropped. Gajaladoba dam is a symbol of the Bangladesh-India water politics. Although Bangladesh a small country compared to India but every country has the right to live independently, save sovereignty as well. Prime Minister Dr. Manmohan Singh has made it plainly, not being Teesta deal in newly completed BMSTEC conference. Even the recently-concluded Bangladesh – India Joint River Commission’s 57th meeting have not discussed the matter. Saying, this deal is not being processed due to the objection from West Bengal Chief Minister Momota Banarjee. In the future, the prospects are weak. It goes without saying that the Teesta water-sharing issue is directly related to our security. Our policymakers see the matter lightly, and then in the country, especially in North Bengal will be in a major crisis. Food security remains vulnerable; even can increase the political instability. Remember, Our tistaya water is our legal rights, which recognized under international law, India’s central government’s responsibility is to ensure that our rights. In 1972, Bangladesh and India Joint River Commission began to discuss the Teesta water sharing issue. In July 1983 Ministerial meeting of the two countries had taken some decisions that Bangladesh 36 percents; India 39 percents and 25 percents reserved for river. But no deal has been made. Here is one more thing need to take into consideration; Sikkim need to get involve in Teesta water-sharing.